Social media is the means by which many of your patients, especially Millennials, communicate with friends and family. Understanding the kind of social media posts that will capture their attention, and bring them into your office, is essential to building a profitable practice. At our practice, we dedicate one hour of time per week, and $0.00 to social media, which is our central marketing effort. It is paying off in an average of four recurrent patient visits a week, two new patient referral visits per week, and an increase in the average frame purchase price of $100, and in premium daily lens sales. Our primary focus is on high-end frame lines and in premium contact lens technology. If you are looking for a simple way to evaluate return on investment for the time and money spent on social media marketing, one of the best resources I have found is this short guide, “The Delightfully Short Guide to Social Media ROI” by Kevan Lee. This blogger has a formula to calculate the exact monetary value of each of your likes, comments or interactions. It’s important to have a specific goal such as “gain new followers” or “increase online purchases of x.” Secondarily, track this goal by tracking your social media analytics using an online resource like Buffer. Thirdly, assign a value to that specific goal like “average sale” brought in by an Instagram follower. Here are six kinds of posts that have worked for my one-OD practice in Charlotte, N.C., in generating interest in, and visits, to my practice. Before and after shots of one of Dr. Dryer’s patients, who signed off permission, allowing the practice to use her photo for marketing purposes. Dr. Dryer says photos like this show potential patients the difference your practice can make in their lives. Why does it work? 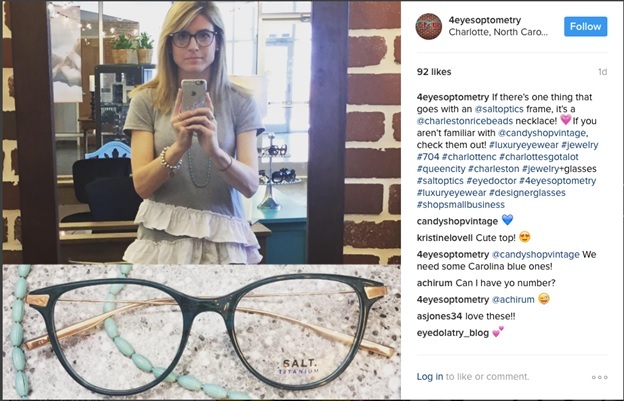 : This kind of post is successful because it involves your patient in the eyewear selection process. 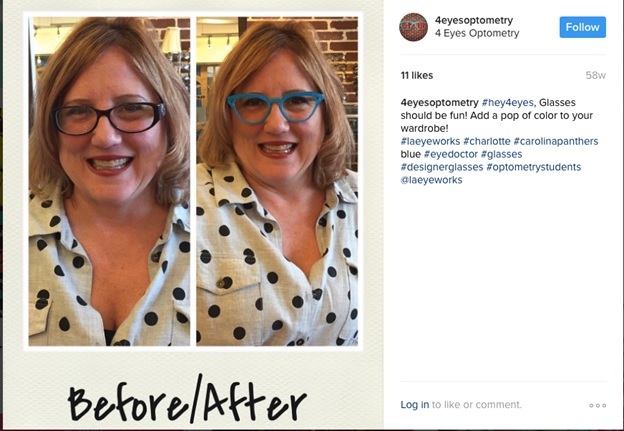 Patients love getting their picture taken, and they get excited about their appearance in their new frames. Additionally, this particular type of post also showcases the expertise of your staff in frame selection. When the new frame accentuates the patient’s best features, and updates their appearance, potential patients recognize the talents of your optical staff. Your practice is no longer just an eyecare facility, but a destination. Your staff is sought out for their skills. This is key to separating your practice from online glasses sales. What resources are needed? : I love the app Polamatic, which I paid about $2 for. It adds a border to your photos, so they look like old-fashioned Polaroids. These are particularly successful with my Millennial-based practice due to the resurgence of all things retro and vintage. How do you measure its success? 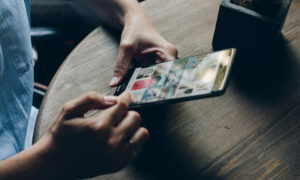 : I primarily use Instagram to connect with my patients. It’s difficult to measure the success of an Instagram post. Mostly, success is based on likes and/or comments. I typically post twice a week, and expect anywhere from 50-70 likes. We have around 530 followers. I also take note of people who follow me on Instagram after a post. If it’s a local company or person, I consider my post successful. I’ve made someone aware of my business and what we offer to the community. Dr. Dryer’s selfie in her practice’s optical. Dr. Dryer says posts that show you and your staff in your office help patients get to know you, and feel comfortable with coming in for a visit. Why does it work? : I find that the posts that receive the most overall involvement by current patients are those that involve the doctor or staff. 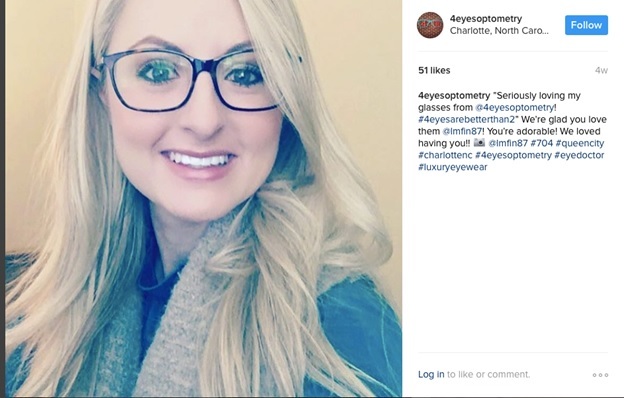 If you’ve been successful in winning them over during their eye exam, they feel connected by social media. In my practice, when I include photos of myself, I try to showcase a new frame or capture my “fun” side, whether it be holiday or sports team wear. What resources are needed? : Creativity! If you aren’t the creative type, engage your staff. What things are you passionate about outside of optometry? What do you want your patients to know about you that they might not learn during an eye exam? What would make your patients tell their friends about your practice? How do you measure its success? : I’m not convinced these types of posts are best for bringing in new patients to your practice, but they are successful in engaging already-existing patients and retaining their loyalty. Patients like to connect with you, to share your interests, and to know you have a life outside of optometry. 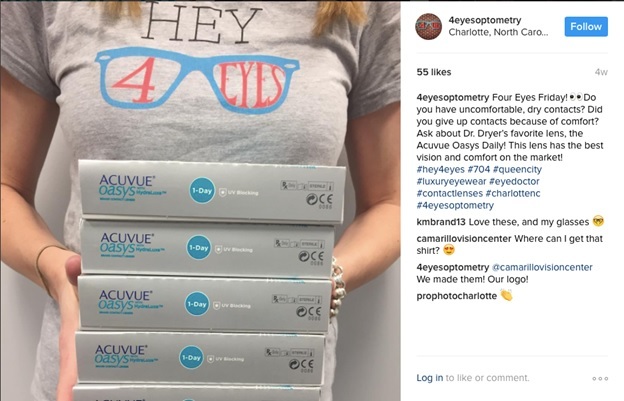 Dr. Dryer says showing patients all of the products you sell, including contact lenses, gives them a better idea of how you can help them, and why they should book an appointment. Why does it work? : At 4 Eyes Optometry, we pride ourselves on having the newest and latest from contact lenses to frame lines. I spend a lot of time educating patients on why I prescribe what I do, and why we carry the products we carry. This type of post is effective in targeting both existing patients and new patients. I’ve dedicated posts to both eye conditions and products, and I get the most response with products. Instagram is primarily known for its visual content and product sales. A showcase of our products is what customers expect from this type of social media. What resources are needed? : A camera and a new product. How do you measure it’s success? : This has been the easiest to measure. Since I’ve started introducing lens technology, I’ve had several existing patients come in and specifically ask for the contact lenses featured. I’ve also had patients come in and ask for a specific frame I’ve featured. 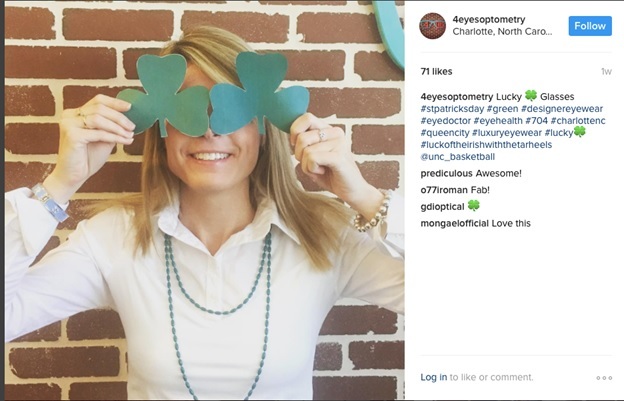 Dr. Dryer salutes St. Patrick’s Day, reminding patients in the process of her practice, and why they should schedule their next visit. Why does it work? : For holiday posts, the goal is not to be too cute or redundant. Too many reindeer, or back-to-school apples, take away from what makes your practice unique. Do holidays, but make it reflect your practice. Your practice, or your products, should always be the main event. Less is more. Anytime I participate in an optometry-related event, I think, “How can I share this with my patients?” Patients enjoy seeing their doctors involved in activities relating to their community or their profession. What resources are needed? : No financial investment. How do you measure it’s success? : Social media site likes and comments are an easy way to measure success. One of Dr. Dryer’s patients shows off how happy she is with the new eyeglasses she got at Dr. Dryer’s practice. The practice got permission from her to use her photo for marketing purposes. Why does this work? : The key to this post’s success is to re-post it from the patient’s Instagram account. This gives your business maximum publicity. Those who follow your patient’s account will see it, along with your patients. If your patients are influencers in your community, you could see a even bigger response! What resources are needed? : Your patients and customers involvement is key! Additional monetary resources may be needed if a partnership is to be formed between key influencers. How do you measure its success? : The success of this post is dependent on the number of followers that your patients have. Many small businesses elicit the help of influencers, bloggers or community leaders to wear their products. Forming these types of partnerships can be mutually beneficial to small businesses. Dr. Dryer says re-posting to her practice’s social media pages favorable posts like this can be a powerful marketing tool. Patients read first-hand about another patient’s positive experience, want to experience it, too. Why does it work? : This is extremely effective because it’s your patient’s words about your practice. Word-of-mouth is always your best marketing technique. 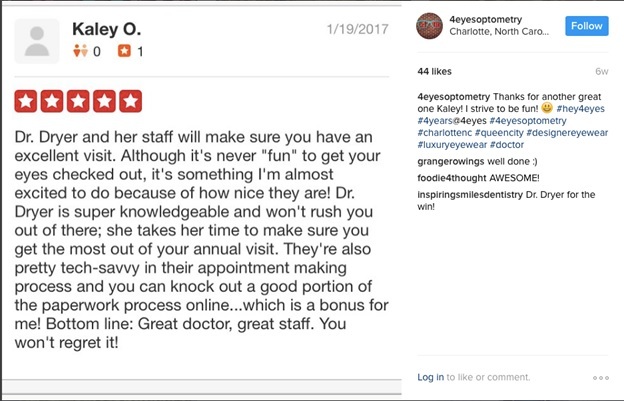 If potential patients only visit your Instagram account, they will miss your fabulous Yelp reviews. What resources are needed? : Reviews are easily pulled from your other social media pages. If you don’t have any, actively ask your patients for them, or you may consult with other paid sources like Weave. How do you measure its success? : Online reviews are now my No. 2 source of referrals, just behind word of mouth. When I ask patients how they hear about us, they will say “you have good reviews.” Every practice should keep track of the ways patients hear about their practice to make good investments in marketing dollars. We track this by asking “How did you hear about us?” on patient intake interviews. GET PATIENT SIGN OFF. Make sure you have your patients fill out a HIPAA marketing release form before using their images or private information in social media posts, or other marketing. EXPERIMENT WITH HASH-TAGGING. “Trial” your hash-tagging on posts to find the most popular hashtags for bringing in new patients. You may look at popular bloggers in your area for ideas. ASK PATIENTS TO POST. Encourage patients to post directly on their social media and “tag” you. This is a great way to generate more awareness, and will likely bring in more new patients (their followers). ASK PATIENTS TO “LIKE” YOU. Actively promote your social media among your patients. Ask them to “like” or “follow” you.